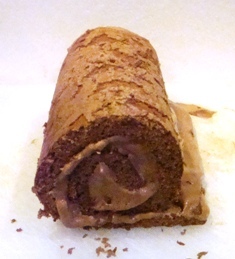 Click here for the history of the chocolate yule log cake . 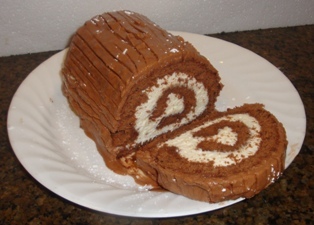 The recipe below produces an awesome light, fluffy and very chocolately, Yule log with a light chocolate sponge cake rolled with an equally light egg-white and cocoa-based filling, then frosted with a chocolate icing! The photos accompanying each step should help make it even easier! I've included some suggestions if you'd rather have a white or other filling. 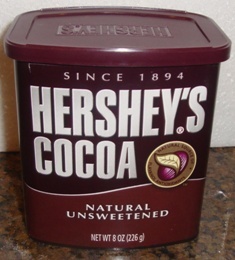 * If you can't get powdered cocoa, you can use 4 squares of unsweetened baking chocolate instead in place of 1/4 cup of powdered cocoa..
Mixer, obviously and electric mixer (stand or hand held) is easiest. 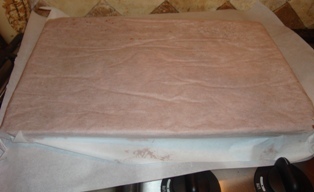 Parchment paper, also called baking paper. Waxed paper is NOT the same. Separate the 5 yolks from whites, obviously into two separate bowls. Place egg whites in a small mixing bowl and let the whites stand at room temperature for 30 minutes or more. 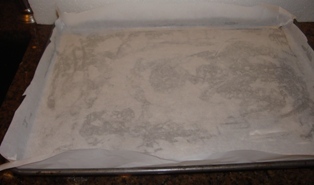 Grease a baking pan, then line the pan with parchment paper. Finally, grease the parchment paper. I use Coconut oil as the grease, but you could use butter, margarine or even (yuck) animal lard. This recipe presumes a 15 inch by 10 inch by 1/2 inch deep pan, but you can use a pan that is larger in any dimension(s), and just crimp the parchment paper at the proper dimensions. In a large mixing bowl, beat the egg yolks on high until they are light and fluffy. 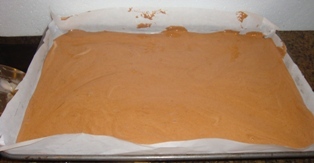 Gradually add 1/2 cup sugar, beating for a few minutes, until thick and lemon-colored. Slowly the flour mixture to the egg yolk mixture and blend on medium, until well mixed. 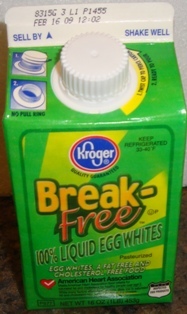 Beat egg whites (in a separate clean bowl) on medium until foamy. Add the 1/2 teaspoon of cream of tartar. Continue to beat until soft peaks form. 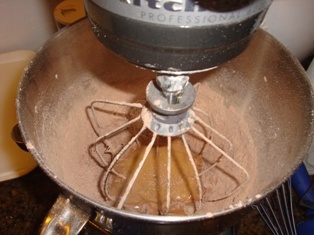 then, slowly add the remaining 1/2 cup of sugar, beating on high until stiff peaks form. 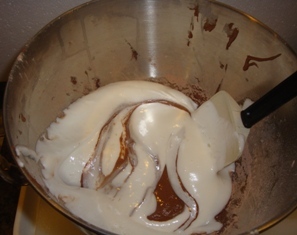 Slowly and gently fold the egg whites into the chocolate flour mixture, until no streaks remain. Gently spread the batter evenly in the prepared pan. Bake in the preheated oven at 350 degrees for about 12 minutes or until cake springs back (do not over bake; certainly not more than 15 minutes. It is better to under bake rather than over bake!). 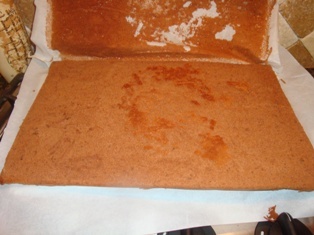 Cool the cake for 5 minutes, then invert onto a linen towel dusted with confectioners' sugar (or another piece of parchment paper, dusted with the powdered sugar). Peel off parchment paper. 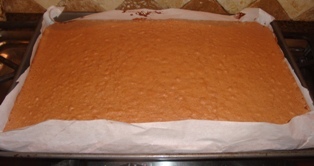 Roll the cake up in the towel or paper, starting with a short side. Then let it cool on a wire rack. The cake portion is now done! If you need to take a break, put the cake in a sealed container or plastic bag. Steps 12 and 13 makes a very light, fluffy and tasty chocolate filling (shown at left, prior to frosting the outside). If you want a white filling instead (shown below), check out the alternatives, below. If you are in a hurry or want a white filling, you could instead just use a topping like "Cool Whip"; but it would need to be served within hours, before the Cool Whip melted and went flat. Another white filling can be made by whipping 1 cup of whipping cream until it is light and fluffy, then beating in 1/2 cup powdered sugar. Obviously, this requires the cake to be kept refrigerated, except when serving it. 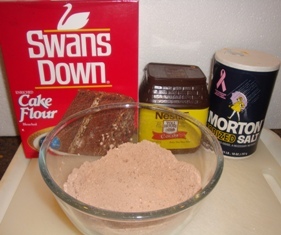 For a mocha (coffee) filling, add 1 tablespoon of instant coffee granules to any of these above. 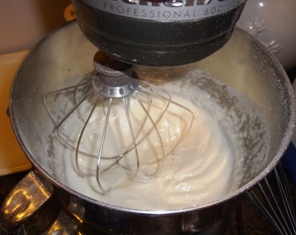 Whip 4 egg whites in a clean dry mixing bowl until fluffy peaks form. 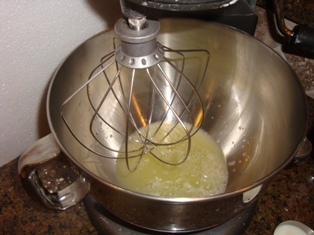 Add the 1 and a half cups of powdered (icing or confectioner's sugar) to the mixer. 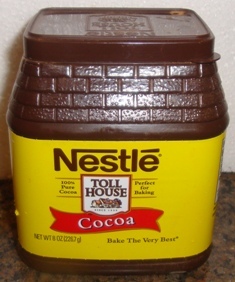 Then add 1/4 teaspoon vanilla extract and 1/4 cup powdered baking cocoa. Whip briefly, but to a uniform color. Unroll the cake! If you want to make two shorter cakes, simply cut the cake in half before unrolling it. The advantage of this is, you can make one with chocolate filling, the other with a white filling, or mocha, etc. 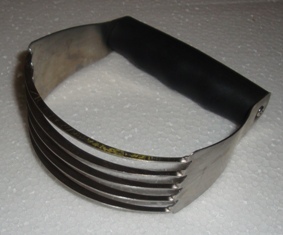 Spread it about at least 1/4 inch thick, up to a maximum of 1/2 inch thick. Gently and loosely roll the cake, not squeezing! You don't want to squeeze out the filling. 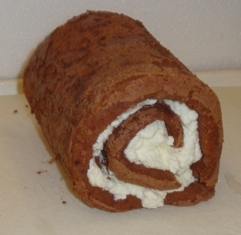 Again, the chocolate filling is on the left, the white buttercream (or whipped cream) is on the right. Now, while the white icing looks better, the chocolate tastes much better... in my opinion. 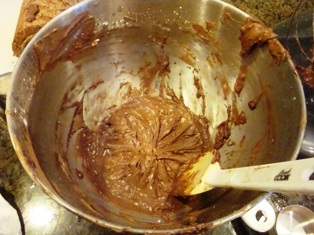 This is an easy and delicious chocolate icing! 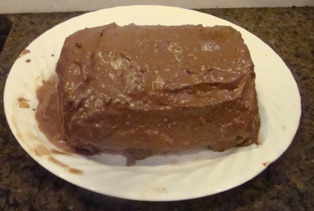 Alternatives: If you are in a hurry, you can use a pre-made, store-bought can of chocolate frosting / icing, instead. 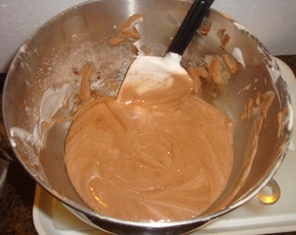 Step 19 - Now ice / frost the cake! Note: the log in the photo appears short because I cut the roll in half to make two short logs, rather than one long log. 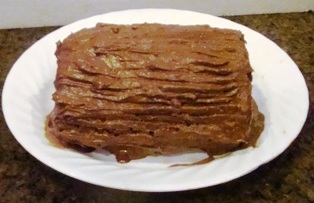 I use a pastry blending knife to make the lines in the icing to look like a log! I just drag the front of it across the log. Of course, you can buy special decorating tools for this, also. You can also dust it with powdered sugar, to simulate snow! You can dust the log with powdered sugar to simulate snow. Marzipan holly leaves can be added. You can keep this in the refrigerator for 3 to 5 days, assuming you but inside a cake container, plastic bag, or other container. If you have any questions, tips of suggestions, please write me! 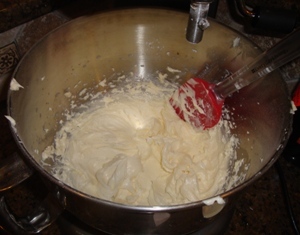 Cream with an electric mixer the butter and sugar until it is soft and light. 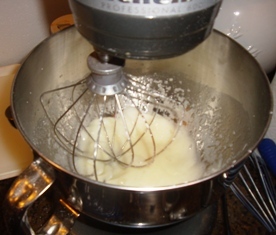 Add the vanilla and just enough milk (or cream) to produce a fairly stiff spreading consistency. Start with a small amount of milk (start with just a couple of tablespoons) - you may not need all of it. 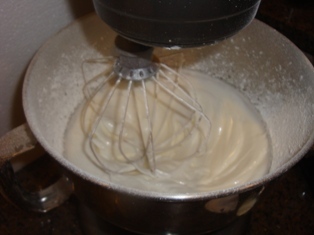 Cream (whip) the butter and sugar in an electric mixer until it is soft and light. Add the cocoa and mix well! 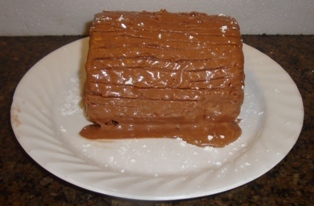 Comments from a visitor on December 24, 2011: "I just wanted to say that I just finished making the Christmas Yule Log from your recipe. I had looked for a recipe and found that yours was the easiest to follow with the clear directions and photos. Plus, we were in the middle of a snowstorm and I had all the ingredients for your recipe on hand! It's clearing up and we're heading out for a Christmas Eve celebration with friends and, thanks to your website, taking along a stunning dessert! Merry Christmas to all!"